The What: PreSonus is now shipping its Studio 2|6 and Studio 6|8 USB 2.0 audio/MIDI interfaces. Both interfaces record at up to 24-bit, 192kHz resolution and feature PreSonus’ XMAX microphone preamps, audiophile-grade digital converters, ultra low-jitter clocking, and MIDI I/O. The What Else: The Studio 2|6 2x4 bus-powered audio/MIDI interface features two front-panel combo mic and switchable line/instrument inputs with +48V phantom power for condenser mics. In addition to the L/R main outputs, it features balanced line outputs for monitor mixing and LED meters for input and output levels. A Cue Mix A/B function allows users to toggle between two mixes while monitoring through headphones. The Studio 6|8 six-in, six-out audio/MIDI interface sports two front-panel combo mic/line/instrument inputs and two rear-panel mic/line inputs. In addition to the L/R main outputs, it features two balanced line outputs for monitor mixing or speaker switching plus S/PDIF I/O. Like the 2|6, a Cue Mix A/B function allows for toggling between two mixes while monitoring through headphones, making it well suited for DJs, or listening in on a performer’s monitor mix. 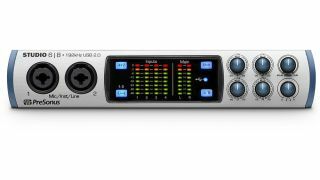 As with all PreSonus recording systems, Studio series interfaces come with the company’s Studio One Artist DAW software and Studio Magic Plug-in Suite for Mac and Windows. The Studio Magic bundle includes seven plug-ins in VST, AU, and AAX formats. The Bottom Line: Studio 26 is well suited for podcasters, singer/songwriters, DJs, live streaming, or for recording sermons and teaching music, while the Studio 68 is designed for use in small studios or for DJs. Both Studio series audio/MIDI interfaces are available immediately at PreSonus dealers. Expected U.S. prices are: Studio 2|6 $199, Studio 6|8 $299.